Although widely overlooked in the field of modern and contemporary art, Sylvia Sleigh was a realist painter who became an important part of New York’s feminist art scene in the 1960s and beyond. 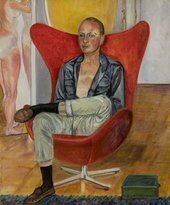 She was particularly well known for her explicit paintings of male nudes, which challenged the art historical tradition of male artists painting female subjects as objects of desire. The exhibition at Tate Liverpool is Sleigh’s first UK retrospective, and the largest exhibition of her work to date. Sleigh trained in painting at Brighton art School at a time when female art students were, as she recalled, ‘treated in a second-rate fashion’. Despite having a solo exhibition at Kensington Art Gallery in 1953, she received little public recognition until her move to New York in the 1960s. There Sleigh and her husband, the art critic and Guggenheim curator Lawrence Alloway, together created a home that welcomed artists, writers and musicians, many of whom Sleigh painted. These works radiate a sense of friendship and emotional attachment between the artist and her sitters, in addition to presenting an array of significant cultural figures from the time. Sleigh painted portraits of both genders, including details such as body hair and tan-lines which rejected the idealisation of female bodies previously found in art history. By portraying the humanising and individual details of each person Sleigh aimed to remove objectification, not desire, from art. Sleigh’s practice produced a body of work that highlights the beauty to be found in every person painted, regardless of their gender and supposed imperfections. Her female gaze still has a powerful impact on viewers and the formal qualities of her painting seem poignantly contemporary. Tate Liverpool has invited LA-based artist Frances Stark to respond to the exhibition, offering an interpretation of Sleigh's work and a contemporary consideration of her relevance and impact. Exhibition organised by Stiftelsen Kunstnernes Hus, Kunst Halle Sankt Gallen, Tate Liverpool, CAPC Musée d’Art Contemporain de Bordeaux and Centro Andaluz de Arte Contemporáneo. Tour supported by the Women's Caucus for Art, USA.